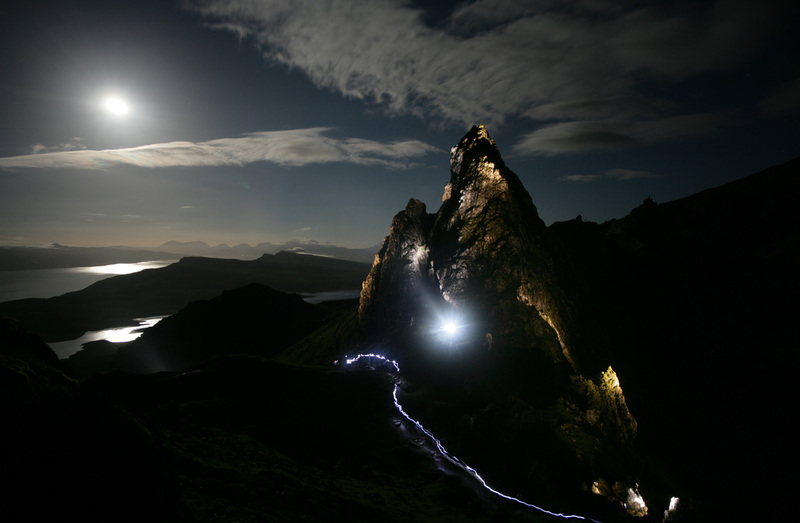 For 42 nights, NVA engaged with and animated the dramatic natural land formation of The Old Man of Storr in Trotternish on the Isle of Skye. 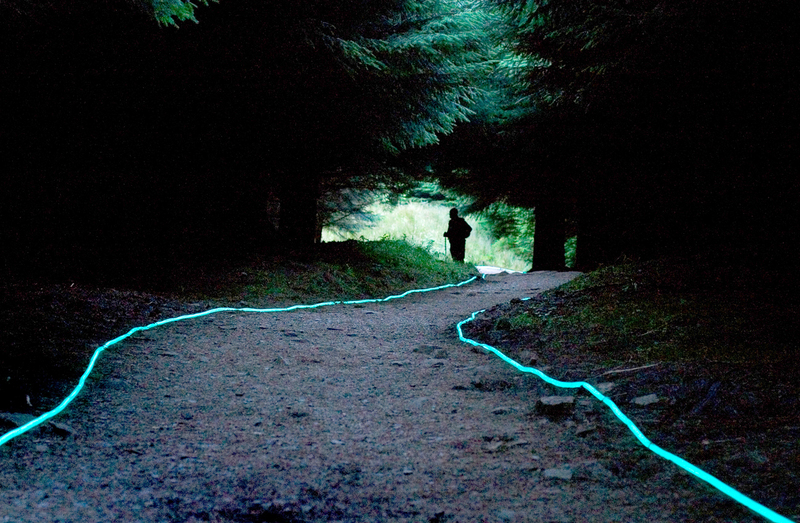 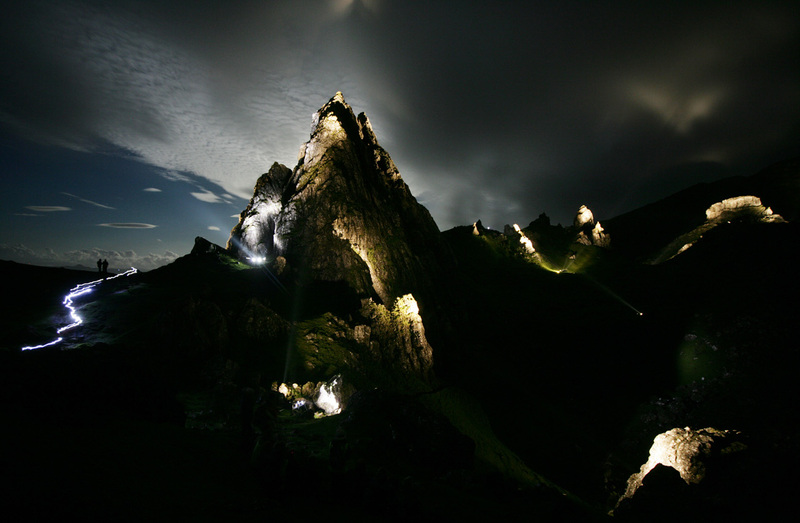 Forty epic light and sound installations brought an audience of 6,500 people, equipped with headlamps, guides and walking sticks, who took part in a strenuous climb and descent to witness one of Europe’s most inspiring land and seascapes in the dead of night. 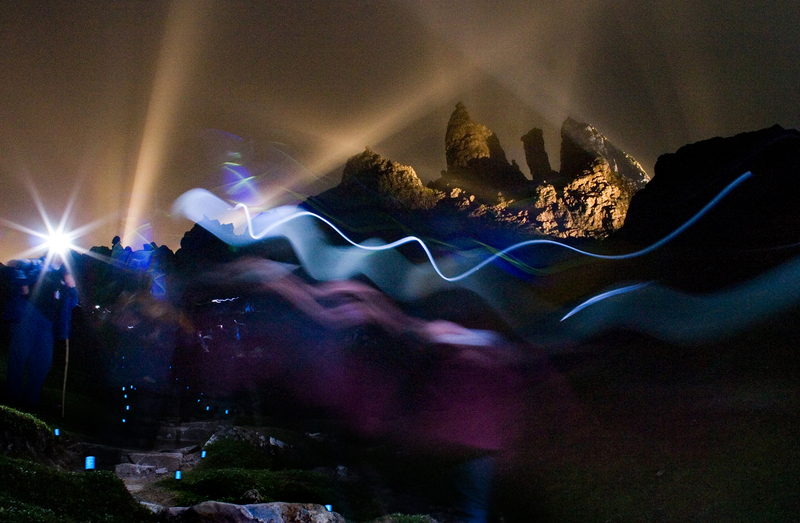 The massed pinnacles and buttresses at an altitude of 1,400 feet were illuminated while powerful soundscapes drifted down from the ridges above. 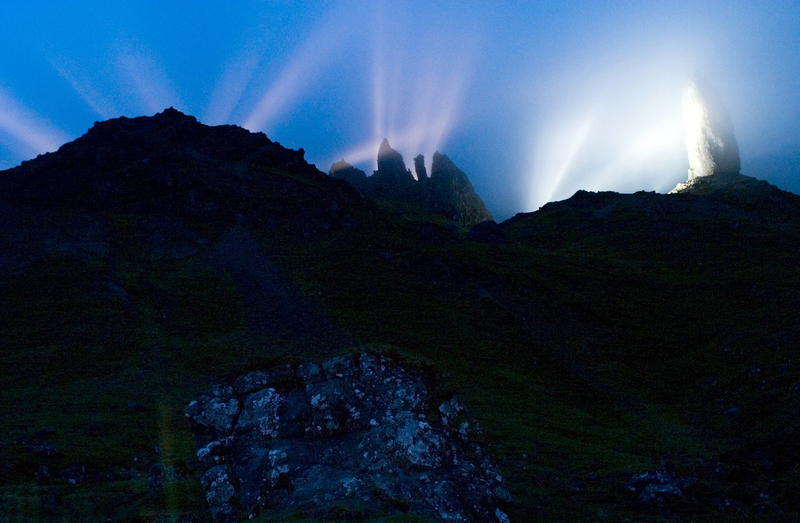 ‘In the mountains we become aware that we are walking through the depths of time as well as physical space. 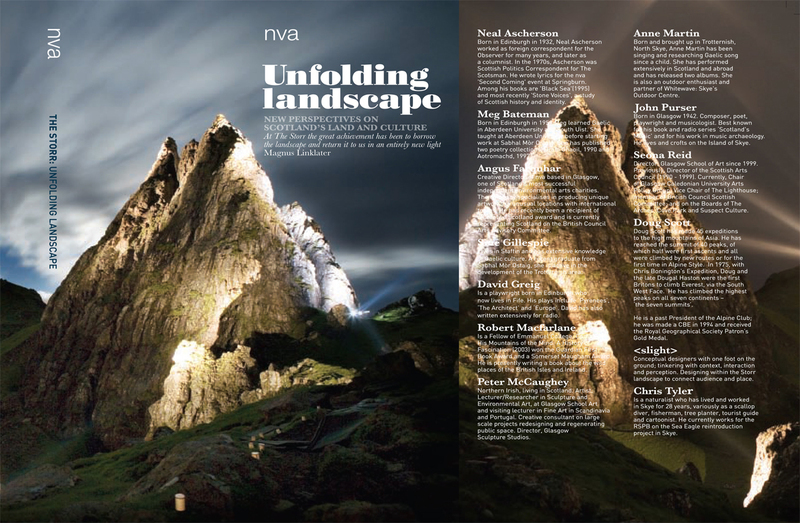 The layers of imagined history both human and geological are as real as the rock beneath your feet’. 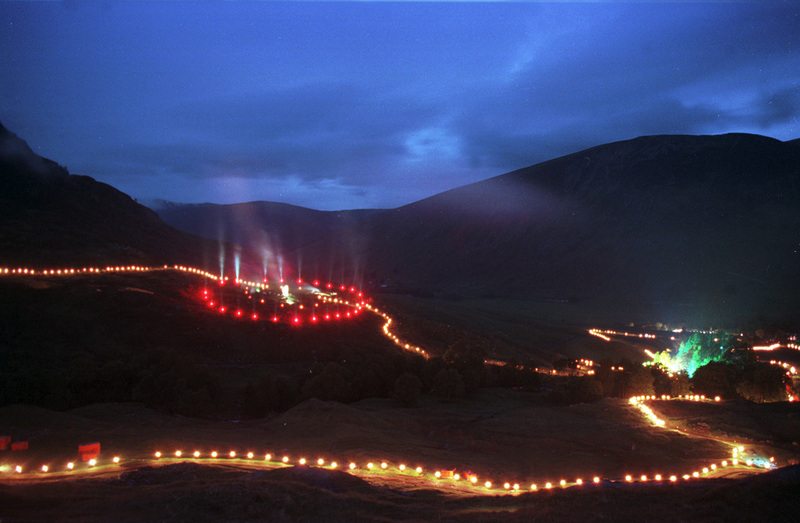 The entire exercise was achieved without the use of any oil burning fuel and generator emissions, a world first in the history of outdoor public art and events set in a rural location. 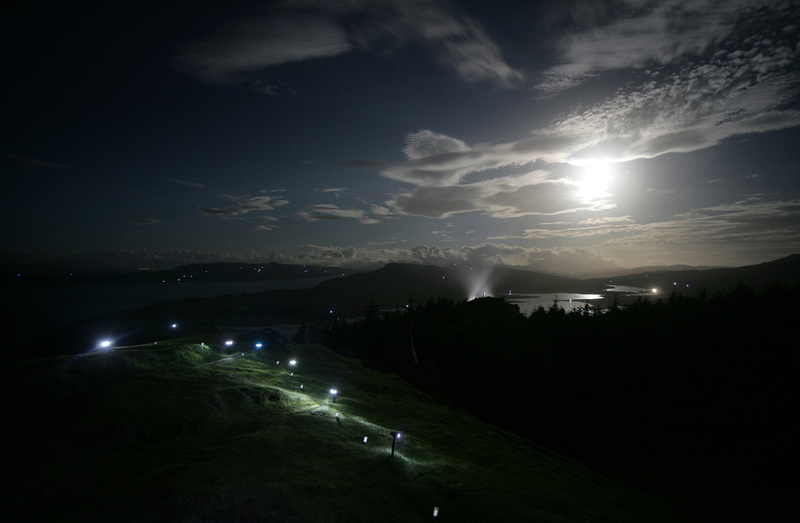 The Storr featured new sound commissions by Skye based composer Paul Mounsey and Geir Jenssen from Tromso, north Norway and included archive voice recordings of Raasay’s great poet Sorley MacLean. 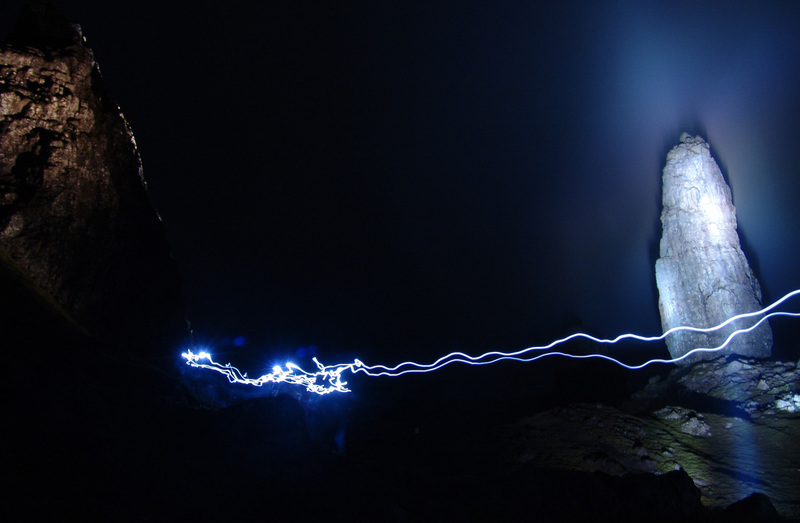 Anne Martin’s resonant live singing drawn from the legendary north island song tradition was heard eerily echoing among the upper cliffs and drifting down through the forest. 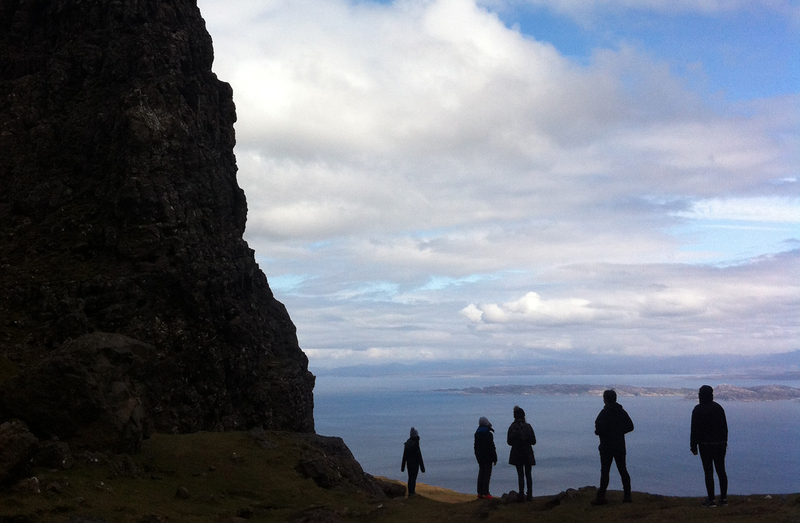 The Storr: Unfolding Landscape created an intense and personal experience for each walker, with the dynamics of the weather leading to varied reactions. 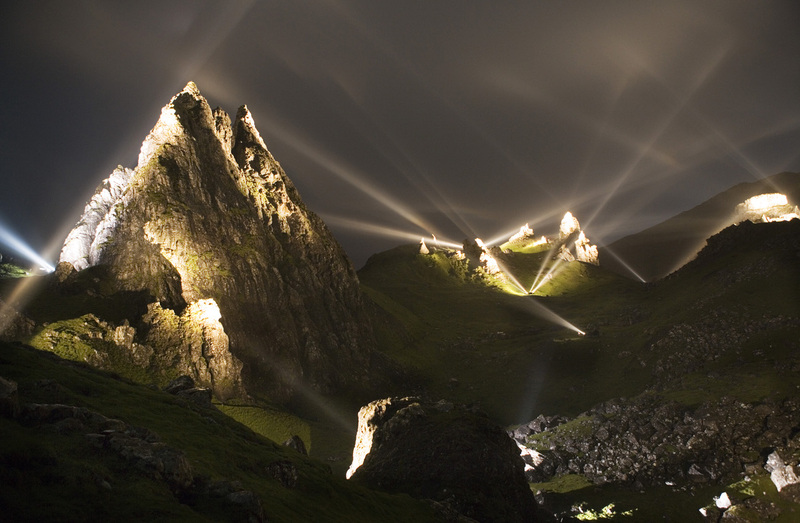 Alex Rigg performed one of the great solo dance efforts of all time with 41 repeated performances of a solo choreography set beneath the 800 feet Storr cliffs. 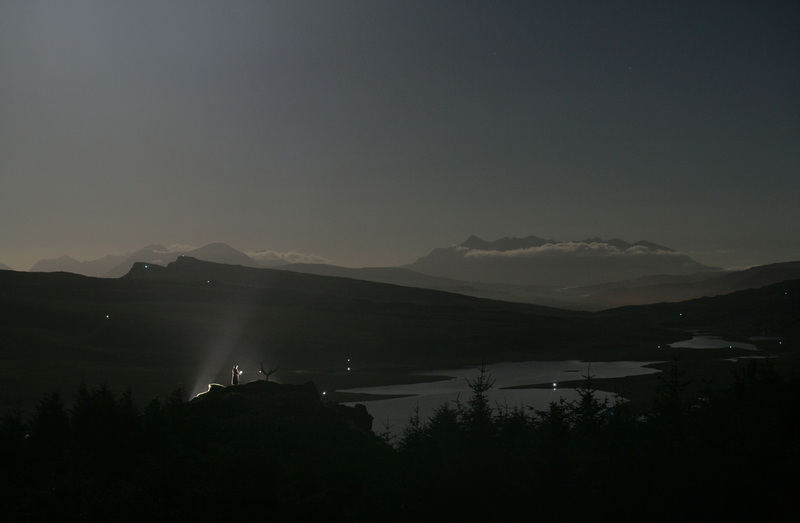 The Storr was David Bryant’s last great work as he was to die within a year. 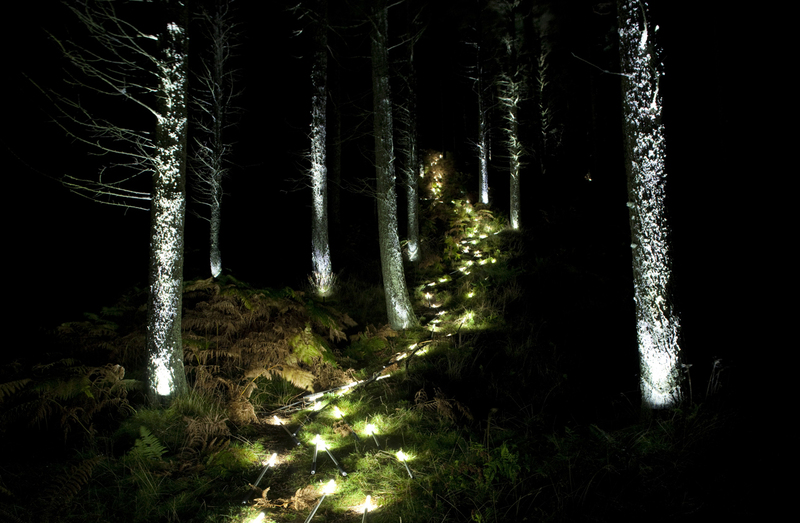 He won Lighting Designer of the Year and spent 2 years fighting to be well enough to make it out onto the Trotternish slopes and deliver his finest work. 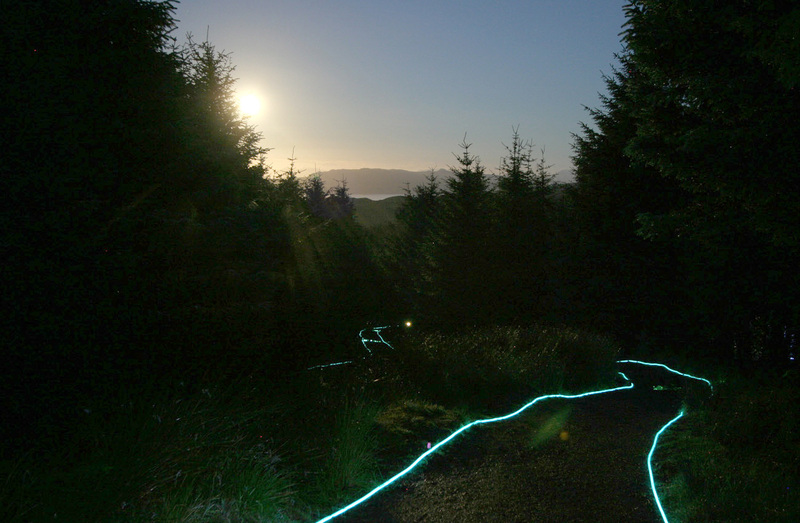 He is still missed to this day and was one of the most creative, courageous and inventive lighting practitioners the world has known.